The China Tourism Association and China Tourist Hotels Association jointly organized the first China’s Gold Tourism Snack Award Ceremony. Well,It has recently opened in Beijing. What’s more, this selection was under the strict ‘comprehensive coverage, obvious characteristics’ principles. But it still picked out a total of more than 200 kinds of top rated tourism snacks. Among them, two Tibet snacks, the ‘Shigatse Pengbi’ and the ‘Tibetan intimate trekking cookies’ were on the list. 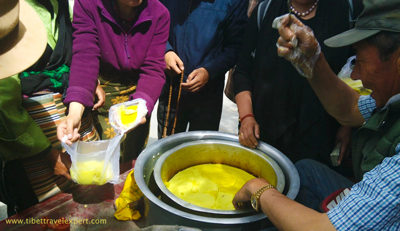 The ‘Shigatse Pengbi’ is one of the specialties of Shigatse, Pea Jelly, which is the favorite snack of local people. Whether in the streets of Shigatse city or in the door gate of Tashilhunpo Monastery, there are vendors carrying an aluminum cauldron. No matter where they are, a group of people will always gather around to have a bowl of Pengbi. 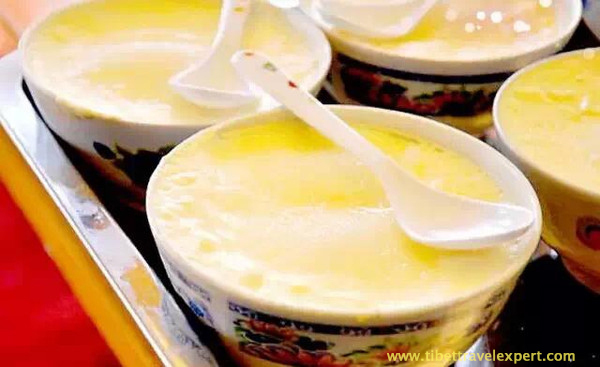 Foreign travelers also like to try this snack when they travel to Shigatse. While the other one is the ‘Tibetan intimate trekking cookies’ which is a kind of biscuit, the materials are milk residue and Tsampa. 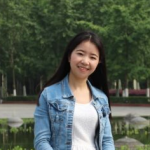 Also it is convenient to carry and well received by tourists during their Tibet trip.